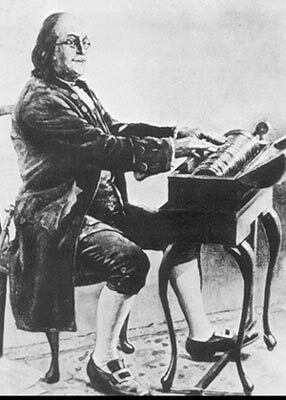 Ben Franklin playing his invention. Have you ever run your finger around the rim of a wineglass and heard the haunting sound it produces? Benjamin Franklin heard the most astonishing concert in 1761, in which the musician Edmund Deleval performed on a set of glassware “tuned” by painstakingly filling each glass to a specific level. Franklin was delighted by the ethereal sounds they made – but less than thrilled at the nitpickery that had to go into each performance. This super-inventor got right to work building what he termed a “more convenient” way to produce this music. Franklin worked with a London glassmaker to create his instrument. The final product was made of about three dozen glass bowls of graduated sizes and thicknesses, each carefully tuned to the proper pitch and nested together. Each bowl had a hole in its bottom through which an iron rod was run, with tightly fitted corks keeping the bowls centered. 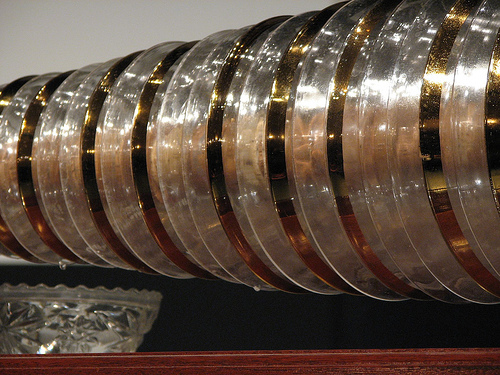 To play the armonica, the player used a foot-treadle to spin the rod, and then used moistened fingers on the rims of the bowls to produce the same sounds made by the more cumbersome “table full of glassware” method. A closeup view of the glass bowls, the “black” keys on a piano are marked here in gold. This thing was the hottest property around! At one point, thousands of armonicas were being produced and played on both sides of the Atlantic, with Germans and Austrians the most eager listeners and composers. After touring Europe with Franklin’s invention, Marianne Davies was given a place in the Imperial Court of Maria-Theresa to teach her daughters to play the armonica, one of whom was… you guessed it… Marie-Antoinette. Unfortunately, as with so many trends, fashions and circumstances worked against the armonica. Drawing-room concerts of the 1700s were giving way to the new, large concert halls of the 1800s, and in a larger environment, the armonica simply could not be heard. About the same time, Marianne Davies’ tinkly harpsichord was transformed into the powerhouse piano we all know today. With no way to increase its volume in those days before electronic amplification, the armonica was reduced to being a novelty, and soon faded from the public consciousness. So, alas, Franklin’s marvelous invention was ultimately abandoned. In the 1999 movie Mansfield Park, there is a scene in which Julia and Maria play an armonica concert for the house party in the garden. (at about 1:09) If the video will not play for you, you can click through to YouTube. It is a brief view, but gives an idea of the kind of audience this instrument drew. Searching further on YouTube will reveal several modern performers in concert. Ask anyone you know who was of elementary school age in the 1970s, and it is a sure bet that they can sing the Preamble to the Constitution to you – Really!And why is that, exactly? Why, a fabulous little show called Schoolhouse Rock. These animated short features were run between the cartoons on ABC Saturday Morning. Schoolhouse Rock just had a way of sticking in your head, A good way. 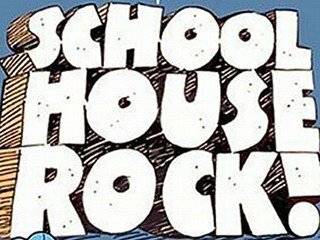 We recommend a viewing of all the Schoolhouse Rock episodes from way back. 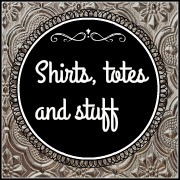 You’re going to smile, and maybe, just maybe, you’ll learn a little something along the way! During the brief time of peace following the Seven Years’ War (which we Americans know as the “French and Indian War”), young British men of a certain class and income bracket traveled to the Continent for a little mind-broadening and oat-sowing. What they came back with horrified their elders, as well it was meant to. Imagine, if you will, the rich papa’s horror as his progeny poked one narrow, oversize-buckled shoe out of his carriage (can’t ride, his pants are too tight) to greet his parent with mincing gait and cheek-kisses, regarding the shocked expressions of the household through a quizzing-glass. 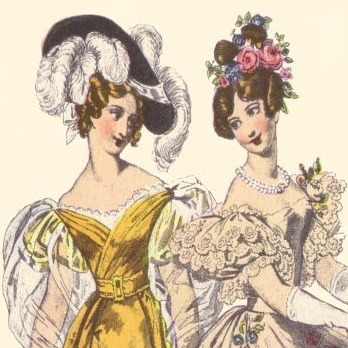 Their clothes were undersized and tight – gaily colored patterned silks and satins in clashing patterns. Bows at the neck sometimes extended past the shoulders. Most ridiculous of all, atop the gigantic powdered wig often perched an undersized tricorn hat. They ate fastidiously, spoke in exaggerated lisps and affected horror at dirt and the plebian world outside their circle. These outrageous costumes and mannerisms marked the young man out as a member of “The Macaroni Club” – not a brick-and-mortar establishment, but a brotherhood of fops. Caricatures abounded. I’m sure the artists thanked their lucky stars for such easy pickings. There are two schools of thought as to the origin of the name – the most accepted being that the food “maccaroni”, encountered abroad by the young men, simply became shorthand for something exotic and fashionable. The second theory, less widely accepted, is that the term is from the Italian for “fool” – maccherone. And a third, that as early as the 1640s, “macaroni” referred to an ornamental feather tied in a knot! The actual song began as a simple harvest tune in 15th century Holland; the insulting lyrics we know today were written by a British surgeon named Richard Schuckburgh, amused by the scruffy Americans he saw fighting the French and Indian War. The insult backfired as the Americans adopted “Yankee Doodle” as their rallying song during the Revolutionary War. They wrote new verses that mocked the British Army and praised George Washington. By the end of the war in 1783, being called a “Yankee” was a matter of pride for the men of the new American republic.